Should You Buy Pre-Surfaced Hardwoods? Hardwoods such as oak, cherry, maple, and walnut are typically rough cut at the lumber mill. The large saw blades on a sawmill aren't designed to leave a clean, smooth surface on the face of the boards as much as they're designed to cut quickly, and the operator's job is to get as much usable lumber out every tree trunk as possible. After the log is cut into boards, the four surfaces of the boards are going to feel quite rough. In some cases, the mill will simply send that hardwood lumber off to be sold as rough cut lumber, leaving it to the lumber wholesaler, to the lumberyard as the final seller or to the woodworker to plane the surfaces of the lumber into smooth, usable pieces. Typically, a lumber miller may want to surface two opposite faces of a board before shipping that board to the wholesaler. The reason is that by surfacing the two opposite faces of the boards, the boards will lay flatter against one another. As a result, they can ship more surfaced lumber on a single truckload than rough cut lumber. If you choose to surface the lumber in your woodshop, you'll need a few power tools to accomplish the task. First and foremost is a surface planer, which takes thin layers of stock off of a single surface at a time until a rough surface is smoothed considerably, although not to a final usable grade of smoothness. To accomplish that final task will require some sanding. The other common task for a surface planer is to reduce the thickness of a board until it is at the proper size for use on the project. 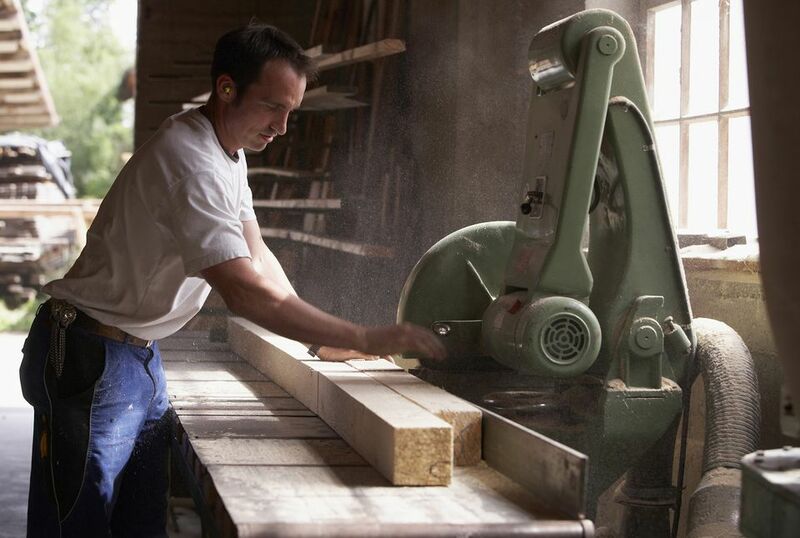 The second major power machinery that you'll need is a jointer. This power tool is designed to plane an edge of a board using the surface that was smoothed out on the surface planer as a guide along the jointer's fence allowing for the edge to be planed, or in this case, jointed at a right angle to the original surface. Once you have a board that is planed on one edge and a corresponding edge is cut at a right angle, or square to the first edge, you can use the surface planer to plane the other two edges of the board using these first two edges as guides. Should you choose to buy your lumber pre-surfaced, there are some terms that you will want to know. If a board is surfaced on the two largest opposing faces, that lumber is called S2S, which means surfaced on two sides. If both faces and both edges of the boards are surfaced, that is referred to as S4S. On rare occasions, you may find lumber that is surfaced on one side or S1S, but that is not very common. When lumber is sized using board-feet as a measurement, it is typically graded in quarters, meaning each quarter is equivalent to one-quarter of an inch. So a 4/4 board should be one inch thick, while an 8/4 board would be two inches thick. There is a caveat to remember; that thickness grading occurs when the board is still in the rough-cut stage. So, once the boards are surfaced, they'll be a little thinner than the quarter measurement. For instance, a 4/4 board will typically measure about 13/16-inch thick between the two widest faces of the board. Similarly, a 6/4 board will be about 1 and 1/4 inches thick (instead of the 1 and 1/2 inches thick one would expect based on the 6/4 label). An 8/4 board that started out as 2-inches thick in the rough cut stage will be about 1-3/4 inches when you measure it as surfaced on two sides.